We are looking forward to this part office Oregon trip. Ben and Ellen have arranged a beach house for us to stay at in Depoe Bay through Oregon Beach Vacations. My aunt, uncle, cousin & his girlfriend from Vancouver are joining us for the weekend too. It’s going to a fabulous weekend. On our way up the coast, we stop and spend some time in Newport. We enjoy the shops, there were some great deals. It is nice to walk along the harbour. You can buy fish right from these fishing boats. We enjoy a great lunch at Clearwater Restaurant. The cod fish is absolutely delicious and the waiter brought a pitcher of Diet Pepsi to the table – how great is that! We arrive at our beautiful Beach house in Depoe Bay. The view is spectacular and if we look carefully we can see the occasional spout from a passing whale. Wow!! We enjoy some sunshine at North Fogarty Creek Beach. The beach is incredible with the ocean and rocks. It is very easy to spend the day, enjoying the sunshine and scenery here. We walk around Depoe Bay and enjoy the views from the sea wall. It is the whale watching capitol of the Oregon Coast. Depoe Bay has the world’s smallest natural navigable harbor. Before heading back to the beach house, we enjoy some drinks and apps at O’Downey’s Irish Pub. It is hard to believe the weekend is over and it is time to leave the Beach House. After the difficult good-byes to Vancouver family, we decide to stop at some scenic spots before returning to Philomath. Our first stop is the Devil’s Punchbowl viewpoint at Otter Rock . The Devil’s punchbowl is sandstone rock that forms a cauldron which was formed when the roof of a sea cave collapsed. 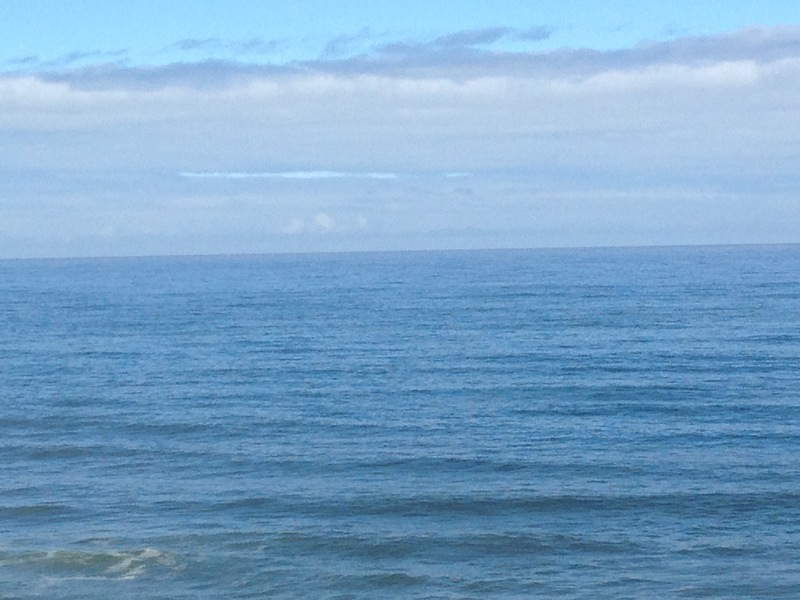 We spend some time admiring it and watching the many whale spouts. Also a nice place to enjoy some wine from the tasting room at the Flying Dutchman Winery. We return to Newport and enjoy watching a harbour seal before going for a tasty lunch at Local Ocean. This restaurant is fantastic! We have been thinking about the food here since last year. The crab cakes are exquisite. We continue on with our little Oregon Coast tour with a stop at Seal Rock.Our last stop before returning to Philomath is Florence which is a historic riverfront town. The sand dunes at the beach are incredible. We enjoy Heceta Beach, the ocean mist rolling in on the beach is something else to witness. The weekend went too fast but it was awesome!